Seed and gardening supply companies are clairvoyant! They seem to know the exact moment when you become sick of winter and spring fever is beginning to set in. Last week, my car got stuck in the snow at the end of our driveway. All I could do was put my boots on and walk up the hill to the house. 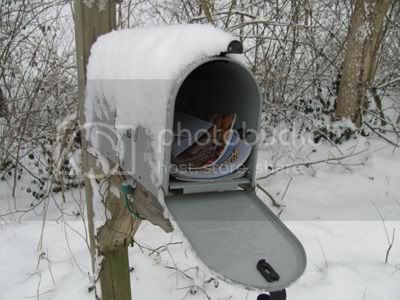 Since the car was now parked closer to the mailbox than the house, I decided to get the mail first. Expecting mostly bills, I was pleasantly surprised to find with those bills some of my favorite garden catalogs! The best catalog that I got was Baker Creek Heirloom Seeds. I wrote all about them and their catalog last year. I got four other catalogs on the same day. Wow - Jackpot! I will put these with my other favorites and decide what new seeds plants and supplies to buy this year. What a great cure for Spring Fever! Today is one of my favorite days in the garden season! I would have to say that my favorite day in the garden is the first ripe tomato of the season. My second favorite day just might be today - the day the new Baker Creek Heirloom Seeds Catalog arrives! As I stated last year, Baker Creek has my favorite seed company catalog. This year's catalog is even bigger than last year! It is full of rare and unique heirloom seeds. There are detailed descriptions and loads of beautiful color pictures! You definitely know what you are getting when you order from them. I never get the feeling that they are hiding anything or are trying to make their varieties sound better than they really are. Everything that I have grown from them has done well and has grown just as they describe. Their 2 foot long Chinese Red Noodle Beans were amazing. Baker Creek helped me grow many colors of heirloom tomatoes - red, yellow, orange, green, black and white. This was fun to do in the full size tomatoes as well as with the cherry tomatoes. I was lucky enough to meet them because another cool thing about them is that they host many garden festivals at their site. They have built a whole little town called Bakersville to host these occasions. My family and I drove about 12 hours just to attend the Spring Planting Festival earlier this year and we had a wonderful time. I posted about our trip when we returned home. In that post, I put on a record 30 pictures of the Baker Creek Festival! You can see that post here. I would love to go again this year - maybe to their end of summer harvest festival! Well, I better end this post so I can start looking at this new Baker Creek Catalog! How will I decide what to buy? I think the size of the garden will have to be doubled again this year! I can already tell that I'm going to like this year's edition even better than the previous years because their are several pictures of little Sasha with the veggies. How cute - and have you ever seen such big cabbage heads?